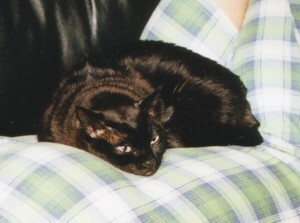 Olive was adopted in January 2000, when she was about nine months old, by Heather and Jim. They write, "She loves to shred wallpaper and play games with our puppy and older cat. 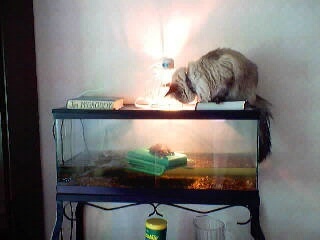 She also loves to lay on the top of our turtle cage and watch every move the turtle makes. They have become good friends." 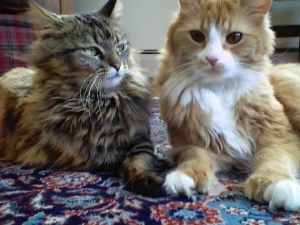 Karen writes, "I'm finally getting around to sending an update of Bea (left), our little tripod we adopted back in August/September 2000. She's doing very well--shown here with her "brother" Nacho (actually, it looks like she's giving him the furry eyeball look!) They're good pals! We love having Bea and she's adapted very well to a multi-cat house, even though our older adult female (Mim) doesn't particularly like Bea. But she races up and down the hallways in the house, teases the male cats and loves to wake us up in the middle of the night with the loudest purring I've ever heard out of a cat -- or nuzzling our hands to have her face scratched while the others (Pip, Mim and Nacho) are passed out cold! I'm so glad we had the luck of finding Bea - she is the sweetest little cat. I love coming home and finding her stretched out on the window perch or sitting on my computer desk, front paw on the keyboard and making all kinds of noise (she's a talker, too). Thank you so much for doing what you do for our furry friends. " Whenever we sit down she is in our lap. If we take her off our lap she will slowly walk over and try to sneak back on. When she wants to be held she will meow at us and 'climb' our leg with her front paws. At night she sleeps curled up next to her mommy's legs. She will also lick our face like a dog!! When our friends come over they all ask where she is because they love her as much as we do." Max did not have a great start in life. When he came to Kitty Angels as a kitten, he was shy and very sick. Dorothy sent us this picture to show everyone what a handsome gentleman he has grown up to be! 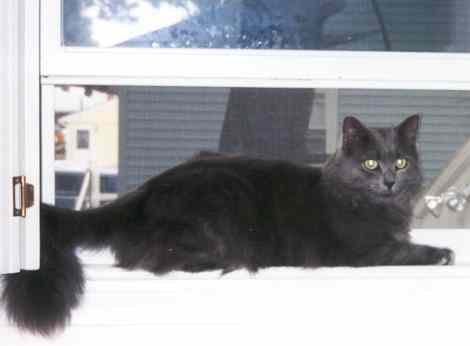 Max writes, through his interpreter Dorothy, "Here I am sitting in the bedroom windowsill, my favorite place to view the world when the weather is nice. I love my home - I am happy here. I let my mommy know this every day by following her constantly, along with Anna and Joshua, my dog family members. I also shower her with a multitude of kisses, head butts, and lots of love. I purr, purr, purr. As you can see, everything turned out well for me. "I want to thank Kitty Angels, because if it weren't for you, I would never experience the love and caring that I receive every day."